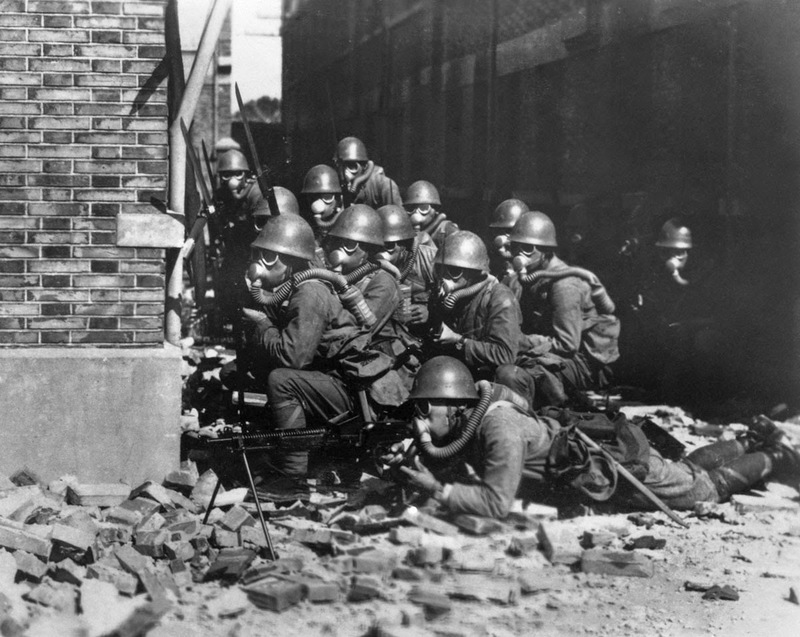 Japanese marines landed north and south of Shanghai. This picture may have been taken on the Jiangsu coast, which is north of the city. Despite the fact that the chemical weapons were prohibited by international laws, the Imperial Japanese Army frequently used chemical weapons during the war against China. In terms of the imagery, this photo is a perfect blend of WWI and WWII. The use of poison gas in warfare is far more common and extensive in WWI and the mobile warfare was the new method during the Second World War. The other nations, including Germany, America and Britain, maintained their own chemical and bio-weapons programs during the war. Mussolini’s Italy even employed mustard gas in Ethiopia in 1935. Yet fear of retaliation deterred the major powers from using chemical or biological weapons against each other. But Imperial Japan had no such fear because backward China had no Weapons of Mass Destruction and no other means of massive retaliation. Moreover, Tokyo viewed the Chinese as a racially inferior enemy—one that foolishly resisted a massive Japanese army that tried for nearly a decade to subdue China. The Battle of Shanghai was one of the largest and bloodiest battles of the entire Second Sino-Japanese War. The battle lasted for three months and involved nearly one million troops and approximately 300,000 died on both sides. The Japanese anticipated taking Shanghai in an incredibly short time, but the Chinese nationalists, despite inferior equipment and training, managed to delay them there for three months. The Japanese eventually drove the Chinese out, but were shocked at the intensity of the Chinese fighting and the scale of their own losses. The Japanese victory was in part as a result of naval artillery fire and aerial bombing. The army marched into the city, seizing assets and carting away anything of value. They conducted wide-spread attacks on Chinese civilians when the army entered the city. The stubborn fighting in Shanghai was one reason the Japanese acted so brutally when they took Nanking. The machine gun in this picture is a Japanese Type 11 Light Machine Gun. The Type 11 was first produced in 1922. Most of them would serve in Chinese Theater though their appearance in the Pacific was not unheard of and the ones found in USA are usually captured examples. The Type 11 was replaced as the main Light Machine Gun by the Type 96/99 Light Machine Gun which arrived in 1936. The Type 11 served as the main squad gun for 14 years, it would be produced for 19 before every factory switched over. Approximately 30,000 were made in total, the gun fired a relatively slow 400rpm or about 6 rounds per sec. It weighed about 11.5 kg (25 pounds) loaded. Japanese small arms were not so good. The philosophy in Japan was that the fighting spirit of the soldier was more important than the weapon. The true warrior would overcome any minor deficiency in the weapon. This was the only one reason that the Japanese put less emphasis on improving infantry weapons than most other combatants in the war. The Japanese Special Naval Landing Forces (SNLF) were the marine troops of the Imperial Japanese Navy. They saw extensive service in the Second Sino-Japanese War and the Pacific theatre of World War II.